Last week, CatTime reported on Deucy, a kitten who was born with two faces in Amity, Ore., on June 11. Sadly, the small feline passed away last Thursday. A “Janus cat” named Frank and Louie holds the world record for the longest-living two-faced cat at 12 years of life. 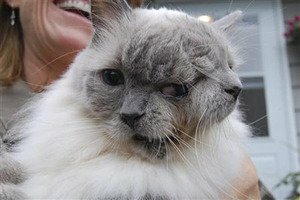 The cat suffered from a condition known as diprosopus, a rare disorder that results in a being with duplicated parts of the head. Felines with this affliction typically have a host of health problems, don’t live very long, and have an average lifespan of two to four days. One cat named Frank and Louie, however, lived for 12 years with the condition; the feline has two mouths, three eyes, and two noses. Deucy was rejected by her mother, but the animal’s owner, Stephanie Durkee, fed the newborn formula from a syringe. A veterinarian who examined Deucy claimed the kitten was in good health. CatTime salutes Stephanie Durkee and her family for their dedication in taking care of the feline.